The cold, wet, windy January night did nothing to deter the formally dressed and be-kilted revellers from venturing forth and congregating in the Village Hall for a celebration of all things Burns. 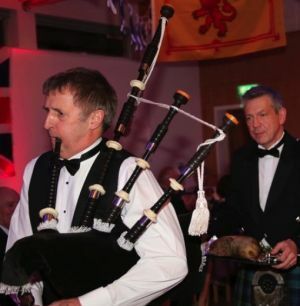 The hall, decorated with the Saltire, the Royal Standard of the Scottish Monarch (the Lion Rampant) and the occasional Union Jack, and well laid tables each named after Scottish football clubs and with lily-based centre pieces, set the scene for the partying hordes. First up, the marking of the dance cards and, of course, a trip to the bar. Then, having been coerced and dragooned into vowing to participate in each and every dance, we took our seats at table where those at the head donned the traditional pinny in the form of Highland Dress - remarkably inconspicuous on those who were already thus attired. The unmistakable drone of the bagpipes (thank you Mike Almond) announced the arrival of the "Great Chieftain o' the Puddin-race", carried in procession by Will Mowatt followed by Brian Watt whose rendition of the "Address to a Haggis" struck fear into those nearest the ceremonial trencher as he violently stabbed and "cut ye up wi' ready slight, Trenching your gushing entrails bright" to rapturous applause. All this, the Selkirk Grace and the Loyal Toast (the first but not the last) paved the way for the feast to follow. Haggis, neeps and tatties filled "the groaning trencher" and were served to all (a veggie option was available) followed by a buffet from no less groaning tables. And then the Toast to the Lasses given by Steve Broughton in the traditional form of praising the role of the women through selective quotations from Burns' work, suggesting that the progress of feminism since the 18th century has been negligible (my interpretation). What followed was greater insight into the domestic workings of the Broughton household when Susan Broughton provided the Reply on Behalf of the Lasses, receiving great applause, particularly from the women present, (so much for my earlier interpretation). And so to complete the circle we returned to our dance cards, and to work off the food (or merely to jiggle it about), made up our sets and muddled through the dancing, with every reel, jig and waltz on the card being danced (a rare occurrence), and called with great aplomb (and patience) by Brian Watt. As the evening came to a close guests linked hands for a rousing chorus of "Auld Lang Syne" before venturing out into the night, well-fed, a little tired and probably a wee bit tipsy. Thanks to all those involved in making this year's Burns Night a memorable occasion, particularly Elaine, Brian and Rory Watt; Sheila and Will Mowatt and Sarah Aspinall. PS This annual event was, again, a sell out - book early for a place at next year's table.